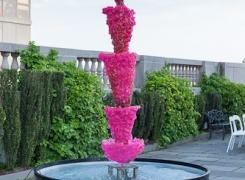 Benglis, who was born in Lake Charles, Louisiana in 1941, began her career as a painter. Moving to New York in 1964, she quickly became immersed in that city's art community at a critical moment in its development. Deeply influenced by the seemingly contradictory work of Jackson Pollock, Claes Oldenburg, and Carl Andre, Benglis began making lushly-colored wax paintings on wood. At a time when most critically-acclaimed work was either dryly conceptual or overwhelmingly expressionistic, Benglis was making work that was concerned with the body, in particular the female body, and toed the thin line between beauty and repulsion. 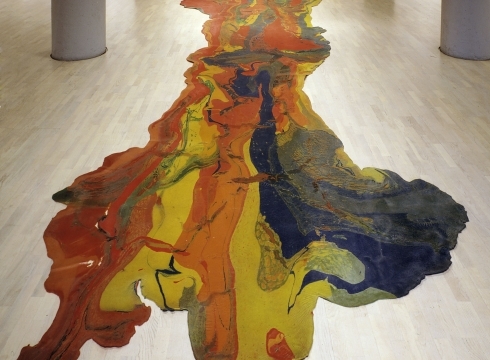 In the late 1960s, Benglis began a series of paintings made directly on the floor. Mimicking the poured paintings of Pollock and Helen Frankenthaler, these works (two of which are included in this exhibition) subverted the dry formalism of the time and led to instant celebrity. Between 1969 and 1974, Benglis was given fifteen solo shows and included in dozens of international group exhibitions. The artist, not yet thirty, was featured in Life magazine and the New York Times Magazine. Feminism became one of the competing discourses of the time and Benglis was one of a small group of female artists, including Jennifer Bartlett and Elizabeth Murray, who achieved international acclaim. Benglis's work continued to evolve during the 1970s leading to large-scale sculptures and installations made from polyurethane foam. Some of these works were cast in metal, including Eat Meat, a large pile of oozing bronze and Wing, a cantilevered aluminum piece that effortlessly flies from the wall. These works were followed by a series of wall-mounted constructions that resembled knotted arms or eruptions of pleated fabric. Most recently she has made knotted masses of bronze and glass suggesting brains or microscopic specimens. This publication surveys major pieces from her career with an essay by critic Carter Ratcliff.